For weeks, 66-year-old James Hodgkinson sat in the lobby of the YMCA in Alexandria, Virginia, focused on his laptop and carrying a gym bag, but never working out. His perch looked on to the field where the Republican baseball team had been practicing daily for about two months. On Wednesday, one of the gym regulars said Hodgkinson was there again at 7 a.m. By 7:09, he had left the building and was firing dozens of rounds at the congressional team, wounding five people before being shot dead by police. Law enforcement officials are piecing together why Hodgkinson left Belleville, Illinois, for Virginia and said it was not clear whether the knew that the Republican team was scheduled to practice Wednesday. But in social media postings, Hodgkinson was highly critical of President Trump and other Republican leaders. The FBI said Hodgkinson had arrived in Alexandria by March and was living out of a white cargo van. As late as March 24, he was still in Belleville, where neighbors reported Hodgkinson to the police for firing 50 rounds from a hunting rifle into a stand of trees. But by early April, Hodgkinson was seen drinking Budweiser and watching golf at a barbecue joint in the Del Ray neighborhood and sitting most nights on a bench near a Walgreens smoking or reading. At the Y, he had become a fixture who drew notice but not suspicion, appearing friendly to some and as a “sourpuss” or odd to others. Hodgkinson left a trail of political rants against Republicans and the “super rich,” and he had adopted a photo of former presidential candidate Bernie Sanders as his Facebook cover image. In the suburbs of St. Louis, where Hodgkinson had worked as a home inspector, he was described as politically angry and personally reserved. Over the past decade, he had periodic outbursts involving neighbors, and a daughter, that caused people to call in the police. The Republican lawmaker who represented Hodgkinson’s home town said the man was “always angry” about the GOP agenda but “never crossed the line” in more than a dozen emails or phone calls to his office. Dale Walsh, a friend of Hodgkinson’s, said Wednesday that Hodgkinson was passionate about his beliefs but always appeared to be “in control.” Hodgkinson was “pretty well fed up” with the political situation, Walsh said, but the shooting was a shock. Charles Orear, 50, a restaurant manager from St. Louis, became friendly with Hodgkinson during their work together in Iowa on Sanders’s 2016 campaign. Orear said Hodgkinson was a passionate progressive and showed no signs of violence or malice toward others. “You’ve got to be kidding me,” Orear said when told by phone about the shooting. Orear described Hodgkinson as a “quiet guy” who was “very mellow, very reserved” when they stayed overnight at the home of a Sanders supporter in Rock Island, Illinois, after canvassing for the senator from Vermont. “He was this union tradesman, pretty stocky, and we stayed up talking politics,” he said. Robert Becker, who served as the Iowa director of the Sanders campaign, said Hodgkinson had no formal role on the campaign and that he could find no one who remembered him. Ahead of the caucuses, about 10,000 people volunteered for Sanders at varying points. Law enforcement officials arrived at Hodgkinson’s home in a rural community southeast of St. Louis shortly after 11:30 a.m. The rectangular clapboard farm house sits amid fields of young corn and budding soybeans. Hodgkinson’s home inspectors’ license expired in November, according to public records, and his wife told neighbors in April that he was planning to retire, they said. Neighbors also said he had recently put his motorcycle up for sale. His wife, Suzanne, works as a receptionist at a local accounting office in Belleville, where employees declined to comment Wednesday, and said she had left for the day. It could not be determined whether her husband had been in touch with her recently. Over the years, Hodgkinson has had multiple scrapes with local police and disputes with neighbors, records show. Police most recently encountered Hodgkinson on March 24, when the St. Clair County Sheriff’s Department received a phone call reporting about 50 shots “in the pine trees” in a lightly populated area near Belleville. The deputy who responded found that Hodgkinson had a valid firearm license and advised Hodgkinson “to not discharge his weapon in the area.” Hodgkinson apparently complied. Federal agents are trying to track the purchase history of a rifle and a handgun involved in Wednesday’s shooting. In April 2006, police records show Hodgkinson went to a neighbor’s house looking for his daughter and “used bodily force to damage” a wooden door upstairs. Witnesses said Hodgkinson forced his way into the home looking for his teenage daughter and grabbed her by the hair when he found her upstairs, according to a police narrative on file with St. Clair County Sheriff’s Department. His daughter escaped and got into the neighbor’s car, but Hodgkinson opened the door of the car, pulled out a pocket knife and cut off the seat belt she was wearing, records show. Hodgkinson’s wife joined him, struggling to pull out their daughter, as Hodgkinson punched the neighbor who was in the driver’s seat of the car in the face, witnesses told police. Later, Joel Fernandez, the boyfriend of the woman who was punched, went to Hodgkinson’s home to confront him. He said Hodgkinson “walked outside with a shotgun and aimed it at Fernandez’s face,” a complaint states. Hodgkinson struck Fernandez on the side of his face with the wooden stock of the shotgun and fired off one round as Fernandez ran away. Police arrested Hodgkinson and his wife and charged them with domestic battery and aggravated discharge of a firearm, according to a narrative obtained by The Washington Post. Police also recovered a 12-gauge shotgun. The county clerk’s online database shows the charges were later dismissed. A few months later, police were called to an argument with a neighbor after Hodgkinson “accidentally struck her dog while it was sleeping in the roadway,” record show. Hodgkinson made multiple complaints about neighbors damaging his lawn by driving through it. Hodgkinson studied at what is now called Southwestern Illinois College, the school confirmed. The college has no record of Hodgkinson receiving a degree. He also briefly attended Southern Illinois University at Edwardsville. A Web page on Yelp indicates that Hodgkinson had been doing home inspections since 1994 and had 30 years of experience in construction and remodeling as a general contractor, and that he worked in Missouri and Illinois. 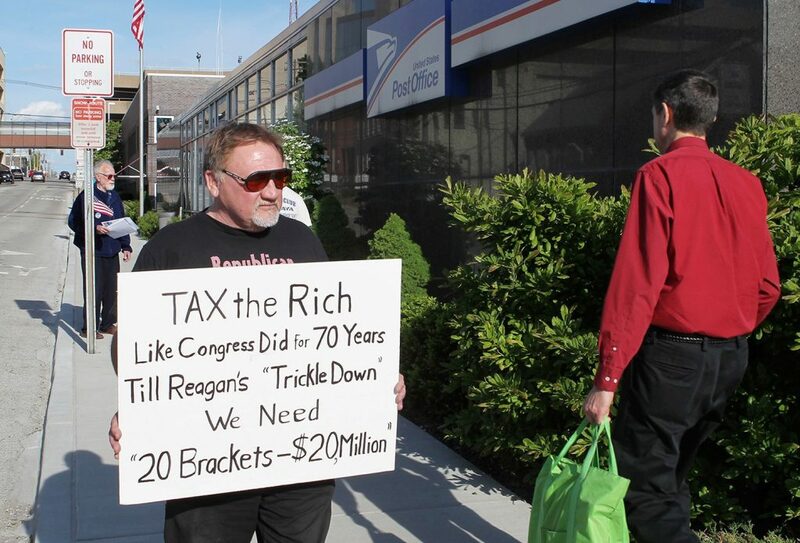 The local newspaper in Belleville published a 2012 picture of Hodgkinson protesting outside the U.S. post office building and holding a sign with the message “Tax the Rich.” The Belleville News-Democrat described Hodgkinson as part of a “99 percent” team that was bringing attention to the financial and political power of the top 1 percent of Americans. In a May 24 Facebook post, he urged his friends to sign a petition against the Nexus gas pipeline between Michigan and Ohio. At the YMCA in Alexandria, the regulars finally had a name to identify the stranger they had encountered almost daily at the building on East Monroe Avenue. The gym is across from the field where the Republican baseball team has practiced every day starting at 6 a.m., according to Rep. Roger Williams, R-Texas. Former Alexandria mayor William Euille said he talked with Hodgkinson nearly every morning in recent weeks and even offered to help him find a job. Euille could not get to the YMCA Wednesday morning because of the police lockdown. He was told by the YMCA’s manager that Hodgkinson had been at gym again before he headed toward the ballfield at about 7 a.m.
By then, Laura Russell, 34, was leaving the gym and within minutes was hiding behind a car to avoid gunfire. She’d noticed a white van parked in front of the YMCA every morning for the past month in the “sweet spot” by the front door. But on Wednesday when she arrived, she said it wasn’t there.